If you have a Raspberry Pi 3, wifi is built into the pi, if you have a pi2 or earlier you'll need a wifi dongle, you can check to see if your wifi dongle is compatible here. You may want to use a dongle with a pi3, in this case see here. 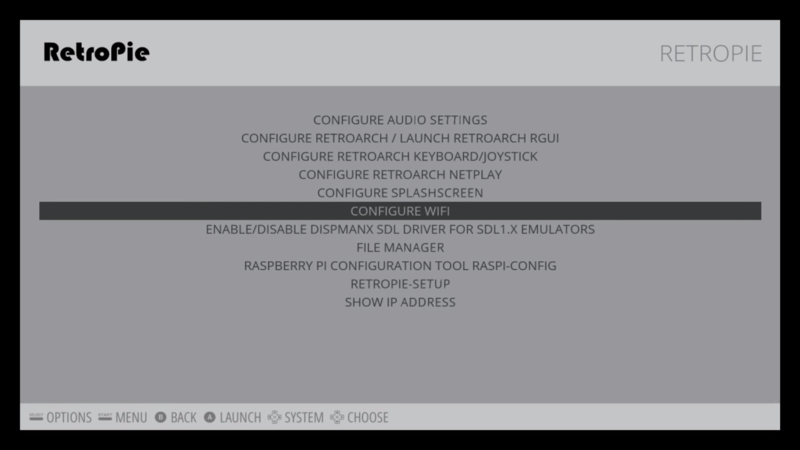 NOTE: In order to use the WiFi on the new Raspberry Pi 3 Model B+, you will need to first configure the WiFi Country via raspi-config. It’s under menu 4 of raspi-config (Localisation options). 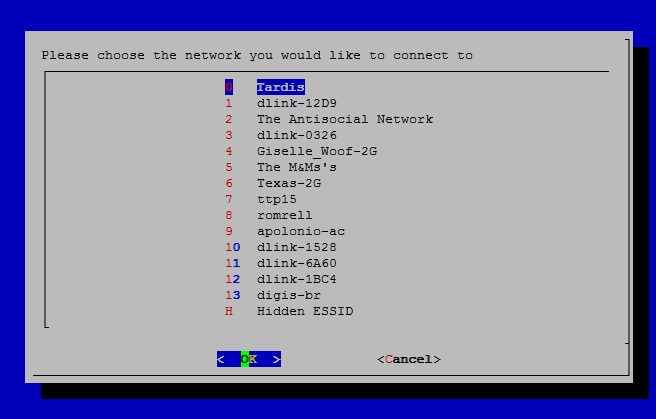 You can start raspi-config from the RetroPie menu in Emulationstation or from the command line with sudo raspi-config. 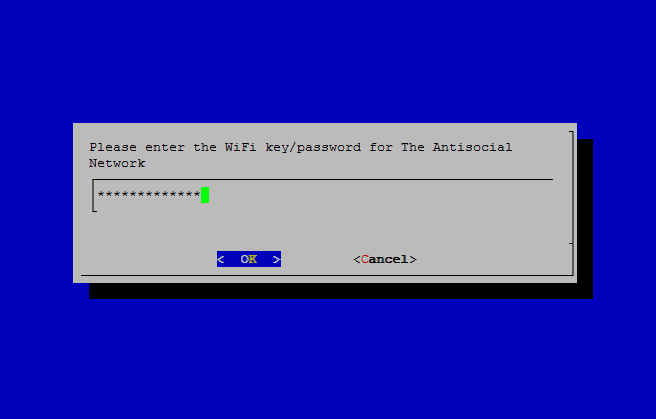 You can then access the wifi module and select the option to "Import wifi credentials from /boot/wifikeyfile.txt"
Starting with Raspbian Stretch, loading the wifikeyfile from the setup script is not necessary. Create a file called wpa_supplicant.conf in the boot partition using the following template. (This will be moved at boot to the /etc/wpa_supplicant directory). Make sure to include the RETROPIE CONFIG ... lines as shown to ensure that the RetroPie-Setup wifi configuration module will be able to cleanly edit/delete your configuration if you wish to change it later. Wifi will not start up if you have an hard wired ethernet connection. After disconnecting the ethernet cable you'll need to reboot to get Wifi started. If you want ssh to be enabled by default as well you can create a blank file called ssh in the boot partition too. This is a 'flag' file and will be deleted during boot after ssh is enabled. you can also add wireless-power off at the end if you have issues with your wifi dongle turning off and on a lot and not being able to maintain a connection. sudo reboot for changes to take effect. on reboot (if configured correctly) your wifi will be working. This method is suitable if you do not have access to the graphical user interface normally used to set up WiFi on the Raspberry Pi. It is especailly suited for use with a serial console cable if you don't have access to a screen or wired Ethernet network. Also note that no additional software is required; everything you need is already included on the Raspberry Pi. ESSID:"testing". This is the name of the WiFi network. IE: IEEE 802.11i/WPA2 Version 1. This is the authentication used; in this case it is WPA2, the newer and more secure wireless standard which replaces WPA1. This guide should work for WPA or WPA2, but may not work for WPA2 enterprise; for WEP hex keys see the last example here. You will also need the password for the WiFi network. For most home routers this is located on a sticker on the back of the router. 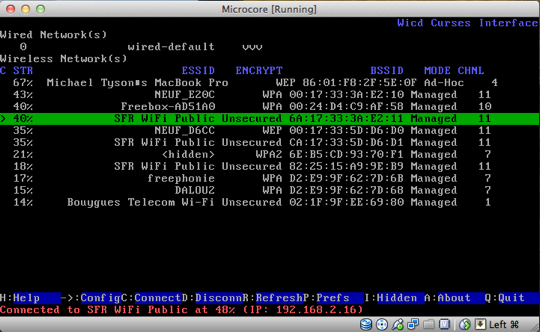 The ESSID (ssid) for the network in this case is testing and the password (psk) testingPassword. We've changed it to wpa-roam so that it will reconnect if the connection drops. The following are different ways of configuring your network depending on what encryption your router is configured to. ssid="NETWORK_NAME" # it can be any encryption type, just make sure to add the "scan_ssid=1" line after your settings. Now save the file by pressing ctrl+x then y, then finally press enter. At this point,wpa-supplicant will normally notice a change has occurred within a few seconds, and it will try and connect to the network. If it does not, either manually restart the interface with sudo ifdown wlan0 and sudo ifup wlan0, or reboot your Raspberry Pi with sudo reboot. You can verify if it has successfully connected using ifconfig wlan0. If the inet addr field has an address beside it, the Pi has connected to the network. If not, check your password and ESSID are correct. Note that this may cause a small amount of background cpu usage, which can stop the CPU from scaling to lowest frequency. you first need to install it with sudo apt-get install wicd wicd-curses and then typ wicd-curses in the terminal to open it. 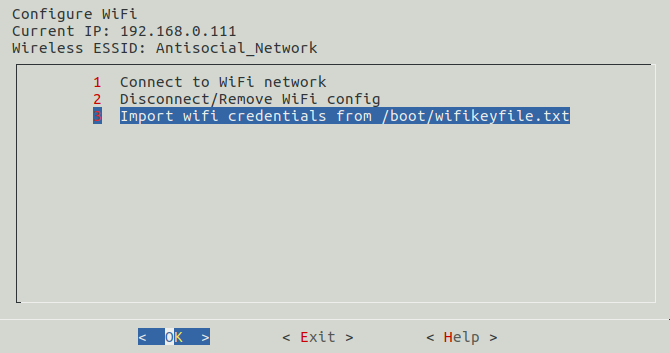 check automatically connect to this network (by pressing enter) and type in your wifi password where it says "key" press F10 to save and then press SHIFT+c to connect and press Q to exit back to the terminal. There are some noted issues with the daemon using some CPU and preventing the Pi from scaling to lowest frequency, so if that's the case you can remove wicd-curses by typing sudo apt-get remove wicd-curses and proceed to setup your wifi using method 2 or 3. You may want to use an external Wifi dongle: maybe your pi case is blocking or slowing the signal (with a metal case it's pretty common), for instance. 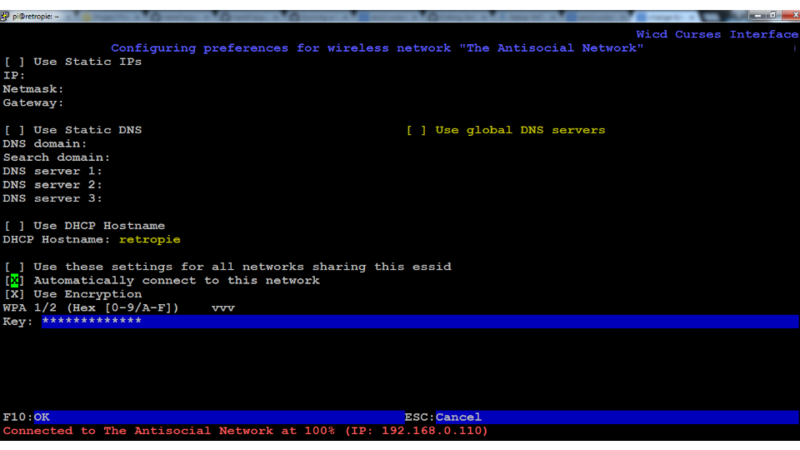 The easiest way is to first configure wifi with the internal controller, using one of the above methods. 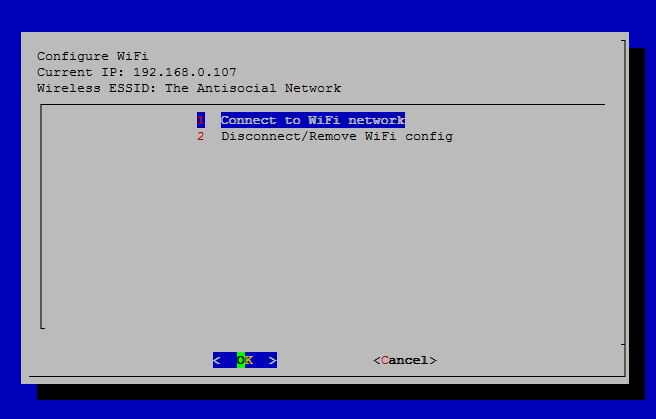 Plug your dongle, reboot, and make sure it's connected using ifconfig : it should appear as wlan1, and have an IP address. Then, disable the onboard wifi by editing /boot/config.txt and adding dtoverlay=pi3-disable-wifi.